Allergen Info: Contains Dairy, Gluten-free. With the overgrowth and popularity of the yogurt market, it is refreshing to see a brand that aims to step out of the box with a clean image, distinctive flavors, and the use of unconventional natural sweeteners. Tarté Green Tea flavor is not only unique but is as delicious as green tea ice cream. With a departure from the Greek yogurt fad in what they call, “Asian Yogurt,” they achieve a yogurt that is not overly tart and has a nice smooth silky texture. Other flavors include, “Original,” Strawberry & Guanabana, Blueberry & Açai, Mango & Coconut, Pomegranate & Goji. What I love most about this yogurt is the use of stevia (all natural zero calorie sweetener) to help lower the overall sugar content. The stevia content is perfectly balanced with the honey (another all natural sweetener) without being overly bitter like other products that use stevia. 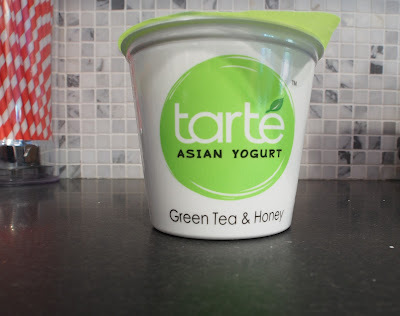 As if things were not great enough with this yogurt, the addition of green tea may just add a tiny boost of anti-oxidants to the overall dietetic profile. The total calorie content is 120 which is slightly less than most nonfat yogurt products. In addition, the yogurt contains a whooping 13 grams of protein. Would I purchase again: YES. Potential for improvement: Hope to see them in more stores down the road! © KATE EZRA WOLF, 2013. ALL RIGHTS RESERVED.